Was It Murder Most Foul? 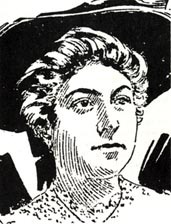 Mary Sophia Money, aged twenty-one, a book-keeper at a dairy in Lavender Hill, Clapham Junction, was, on Sunday, 24th September 1905, found lying in Merstham Tunnel, on the London, Brighton and South Coast Railway, at approximately 10.55pm, by one sub-Inspector Peacock. In her mouth was a piece of white veiling. The poor woman's injuries were fearful; her skull had been fractured and one of her legs had been severed. A coroner's jury, sitting on the 16th October, whilst agreeing that Miss Money had met her death through a fall from a train, were unable to determine whether it was murder, suicide or mischance. Nonetheless, there is in this case a strong presumption of murder. First, the strip of veiling in the mouth had all the appearance of being a gag. Secondly, although it was shown that she must either have fallen out of the 9.13pm. train from London Bridge to Brighton, or the 9.33pm. 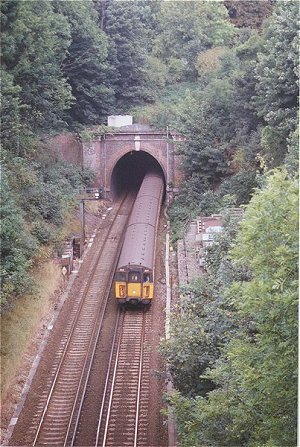 from Charing Cross to Reading, both these trains had emerged from Merstham Tunnel with all their carriage doors shut. Whilst the train was still in the tunnel somebody must have closed the door, after Miss Money had fallen to her death. There was and still is some mystery, too, about how Miss Money had come to be in a train at all that Sunday night. At about 7pm. she had left the dairy- where she 'lived in'- saying she was going out for a stroll and would not be long away. But a little earlier she had been seen consulting a railway timetable. This might suggest that Miss Money had some secret appointment to keep for which that pleasant Sunday evening stroll was convenient cover and excuse. If so, did she keep it before boarding the train? There seems little doubt that Miss Money, unknown to her family (with the possible exception of her brother, Robert Money), had a man friend whom she went to meet on that fatal Sunday night. Perhaps she met him at Victoria or at some other station and after they had eaten somewhere (for the autopsy showed that she had had a meal about three hours before her death),the friend suggested a short journey in a first-class carriage. It is well known that a first-class carriage on an evening train is a very satisfactory way to secure a little privacy. The friend no doubt booked, and retained the tickets, and perhaps there was a struggle when he was unable to achieve the real purpose of the journey. Miss Money had a purse and money when she left Clapham; the purse was never found. Was it taken to give the impression that robbery was the motive? Or was robbery the motive after all? Was the murderer an acquaintance, or was he a casual pick-up? Who was the man who left the train at Redhill? He was described as thin, with a moustache, and wearing a bowler - not a very helpful description at a time when bowlers and moustaches were commonplace. He was never traced and must have gone the same way as the man with the dark moustache who left the train at Wandsworth in the case of Elizabeth Camp in 1897. It seems obvious that the inquest left a great deal still concealed, but, in the absence of any real evidence, it is difficult to see what more could have been done to establish the fact of murder. One extremely unsatisfactory feature of this case was the character of Miss Money's brother, the aforementioned Robert Money. He was proven to be an unscrupulous liar and one is indeed left with, as back then, the nagging question; did Robert Money tell all he knew about the death of his sister? that was part of a series "Murder in Transit"
published in the BTP Journal. Massive thanks go out to you.